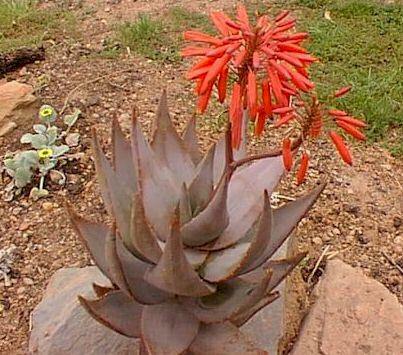 Aloe comptonii was named after the second director of the National botanical gardens of South Africa, Professor R.H. Compton. Status: Aloe comptonii is not threatened. Distribution: Aloe comptonii has a large ditribution area, from Montague in the Western Cape to Uitenhage in the Eastern Cape. Stem: Plants are usually stemless but they may develop stems up to 1 meter long in old specimens. Leaves: Leaves have a dull-bluish colour and are up to 300mm in length, leaves are narrow and triangular in shape, small sharp white teeth are present on leaf-margins. Inflorescence: Inflorescence may be single or twice branched, racemes are short and head shped with many flowers. Flower: Flowers are red in colour, thin in shape and pendulous. Flowering Time: Aloe comptonii flowers from August to January. Frost Protection: Aloe comptonii struuggles in colder climes therefore frost protection is required.